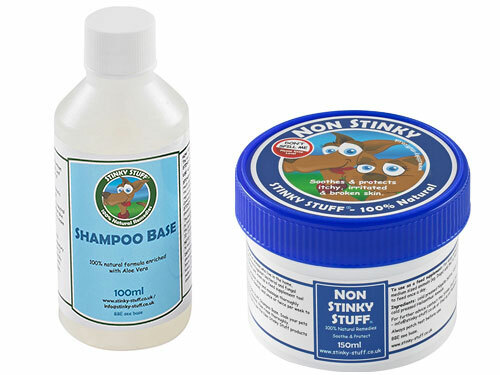 Non Stinky relieves itchy, irritated skin and redness. Soothes minor cuts and abrasions. Moisturises dry, flaky skin. Provides effective relief from allergies and fungal irritations. Conditions the coat and skin. 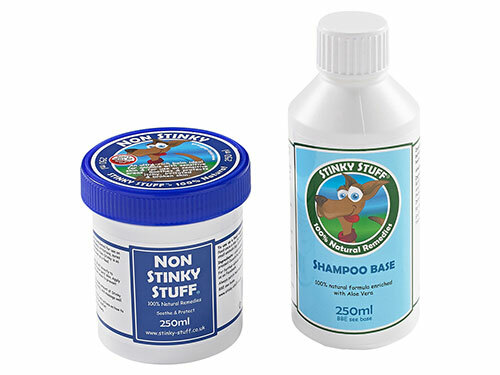 Non Stinky can be used as a massage rub, shampoo and a feed supplement. Using all three methods really helps to tackle irritated skin from all angles. The massage rub provides targeted relief to irritated skin. The shampoo method provides all over relief and protection to irritated skin. Adding it to the food provides the all-important omega-3 and omega-6 fatty acids, plus biotin and Vitamin E, to provide relief from the inside, condition the coat and skin and help promote general wellbeing.